I stowed the paper towel dispenser in the basement (despite much grumbling from the hubby). We will now use dishrags in place of paper towels. I also replaced the paper napkins with cloth napkins. It should be noted that I did not purchase these reusable items. I simply took them out of the cupboard and moved their disposable counterparts out of reach. When I was keeping my trash diary last year, I didn’t realize just how many paper towels, paper napkins and tissues I used on a daily basis. So when I started The Rubbish Diet last week it came as no surprise to find them still filling up my bin. While it won’t take much weight out of my trash bins, these items are definitely disposable products I can easily do away with. This entry was posted in The Rubbish Diet and tagged convenience, disposable, The Rubbish Diet. Bookmark the permalink. 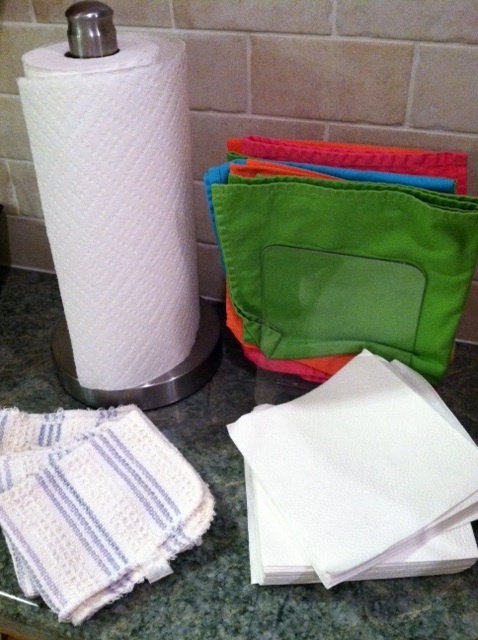 3 Responses to Paper towels be gone!